(Left to Right) Top Row: Isabel Guillamón, Rosa Córdoba; Middle Row: Javier Sesé, José María De Teresa, M. Ricardo Ibarra; Bottom Row: Sebastián Vieira, Hermann Suderow. *Present address: Department of Applied Physics, Eindhoven University of Technology, The Netherlands. Recently we studied the effect of random disorder in a particularly simple two dimensional system and found a new recipe to enhance order. We used a thin superconductor under magnetic fields. The Cooper pairs in the superconductor turn and form quantum vortices. Each one is like a small tornado, but they are all very tiny and, what is most important, they all look exactly the same and repel each other. As a result, they form a perfect hexagonal lattice, which can be imaged with a surprising accuracy. March 10, 2013: "Nanostructuring Improves Vortex Pinning in Superconductors at Elevated Temperatures and Magnetic Fields" by R. Córdoba, T. I. Baturina, J. Sesé, A. Yu. Mironov, J. M. De Teresa, M. R. Ibarra, D. A. Nasimov, A. K. Gutakovskii, A.V. 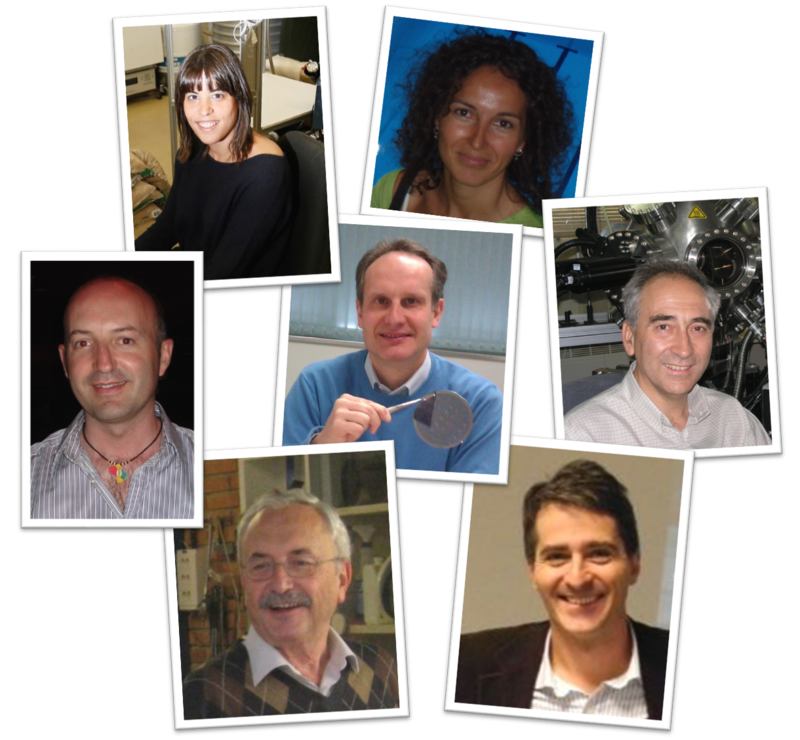 Latyshev, I. Guillamón, H. Suderow, S.Vieira, M. R. Baklanov, J. J. Palacios, V.M.Vinokur. To introduce random disorder in a controlled way, we made a one-dimensional nanostructure and showed that, under certain conditions, the hexagonal lattice floats over the nanostructure (Fig.1 right panel). The floating lattice disorders when increasing the vortex density. Random disorder appears because both lattices are incommensurate. We find that the transition into the disordered state occurs far above present expectations from random field theory. Our conclusion is that the weak one-dimensional correlations inhibit the effect of random disorder. 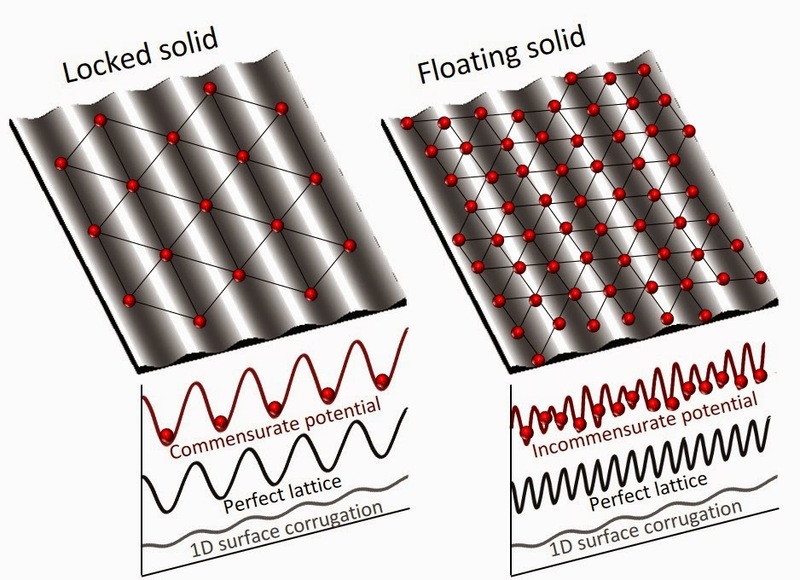 Figure 1: Vortices in a hexagonal lattice are shown as red points. A linear modulation acts on the vortex positions. When the vortex density is low, vortices are confined to the minima of the linear modulation, and the interaction among them is essentially confined to the lines along the potential minima, as schematically shown in the left panel. However, when the vortex density increases, one can accommodate many vortices within one modulation’s wavelength. In the right panel we schematically show this situation (for clarity, we only draw a small amount of vortices). In that case, the lattice and 1D potential modulation have incommensurate spatial periods and the orientation of the lattice no longer follows the linear modulation. The resulting vortex landscape is quasi-random. The vortex positions are slightly displaced with respect to the ordered lattice. In this work, we show that the displacement grows logarithmically with distance, a feature which demonstrates that the disorder created by this situation is scale-invariant. To see this in more detail, let us think of many identical particles that repel each other forming a single layer on a corrugated surface and at zero temperature. Let the position of the particles depend on the size of the corrugation. If the surface shows a periodic one-dimensional pattern, as the wrinkles you create on a carpet when you lay it down on your floor, you may obtain hexagonal order commensurate to the wrinkles (left panel of Fig.1, ). The question is, what happens if you produce a fully random pattern which looks the same at all scales and increase the size of the corrugation? To answer this question (posed in several theory papers some time ago, see e.g.Refs. [3,4]) we first need to create such a random pattern. Think of a carpet with many small (much smaller than the particle size) and stiff yarns of many different lengths. To make such a carpet, you have to prune it yarn by yarn choosing each time a completely random height. This looks difficult. Instead, we preferred to use the one-dimensional modulation . The wavelength of the modulation is incommensurate to the wavelength of the ordered particle lattice. Disorder in the particle positions appears automatically, simply because both lattices do not match. Then, as the second step, we decrease the interaction strength among particles. This is easy for vortices in superconductors . We just have to increase the magnetic field, and we effectively increase the size of the corrugation, with respect to the strength of the interaction among particles. The experiment directly showing the disorder transition in the vortex lattice was made using a scanning tunneling microscope effectively at absolute zero in the low temperature laboratory of the Universidad Autonóma de Madrid . The thin superconductor with a weak one-dimensional modulation was fabricated in the Laboratory of advanced Microscopies & Nanoscience Institute of Aragón . We eliminated the effect of temperature altogether and produced a very well controlled linear nanostructure. We imaged up to several thousands of vortices in Madrid. This allowed us to characterize the critical exponents of the transition very accurately. Transitions are often measured in macroscopic experiments, where the obtained information is the result of the average of particles’ positions and the interaction among them. Even microscopic experiments, as neutron scattering, provide an average over many particles. In our work, we were able to show the macroscopic behavior by imaging lots of vortices one by one. This allowed us to characterize precisely the transition. 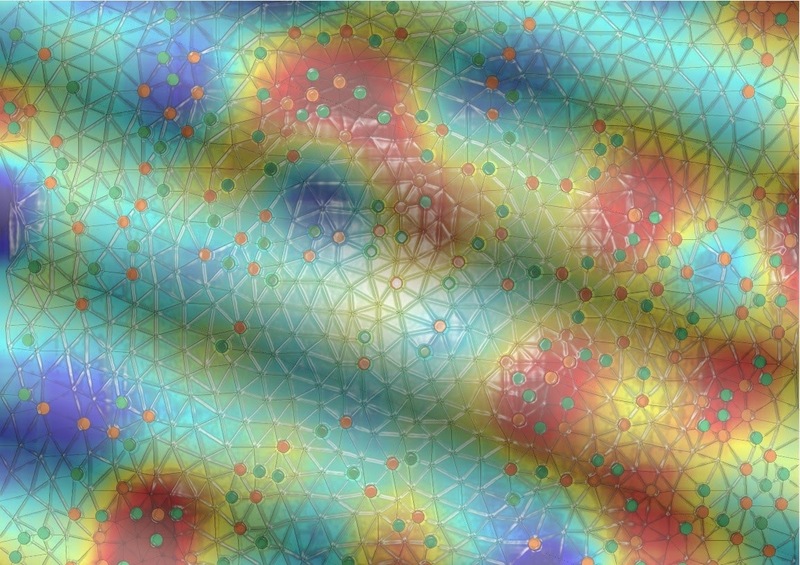 The order-disorder transition goes on by particle displacements producing topological defects (dislocations and disclinations) in an otherwise ordered lattice. The experiment shows how random quenched disorder progresses in the lattice when increasing the magnetic field. We find a logarithmic increase of displacements with respect to the ordered lattice at low fields and density fluctuations in the high field disordered phase. Both effects nicely agree with random field theories. But we also find that the size of the random potential at which the transition takes places does not agree with random field theory. On rather universal arguments, theory finds that those topological defects should arise at a critical disorder strength of 1/8 [3,4]. The experiment gives a much higher critical value, of 1/2. The lattice stays ordered over a significantly larger range of magnetic fields than expected. What is favoring order? The answer lies in the correlations produced by the one-dimensional modulation. This was discussed theoretically for spin systems , but had not been fully addressed by experiments before. Although the one-dimensional modulation does not influence the orientation of the lattice nor directly determines the precise positions of the particles in the lattice, correlations give consistency to the two dimensional hexagonal order. Figure 2: Image of the vortex lattice in the high field disordered phase at 5.5 T taken with our microscope. Background color represents the intensity of vortex density fluctuations. The lattice is shown by its Delaunay triangulation. Disclinations –five or seven coordinated vortices, green and orange dots, respectively– and disclination pairs –dislocations– are present over the whole surface producing a very disordered vortex lattice. The 1D thickness modulation generating the symmetry breaking disorder is also shown. The result that you can help supporting an ordered hexagonal two-dimensional lattice in a random medium by introducing a tiny amount of symmetry breaking correlations is both useful and unexpected. It adds now a new looking-glass for vortex physics in nanostructured superconductors. Our to-do list includes studying vortex dynamics in presence of the disorder potential. By applying a current, we want to see when vortices start moving and study the stability of superconductivity to disorder. The careful observation of vortex lattices in superconductors will be useful to understand more about the influence of disorder in macroscopic quantum coherence. I. Guillamón, R. Córdoba, J. Sesé, J. M. De Teresa, M. R. Ibarra, S. Vieira, H. Suderow, "Enhancement of long-range correlations in a 2D vortex lattice by an incommensurate 1D disorder potential". Nature Physics, 10, 851 (2014). Abstract. Piero Martinoli, "Static and dynamic interaction of superconducting vortices with a periodic pinning potential". Physical Review B, 17, 1175–1194 (1978). Abstract. Thomas Nattermann, Stefan Scheidl, Sergey E. Korshunov, Mai Suan Li, "Absence of reentrance in the two-dimensional XY-model with random phase shift". Journal of Physics I France, 5, 565–572 (1995). Abstract. David Carpentier, Pierre Le Doussal, "Melting of two dimensional solids on disordered substrates". Physical Review Letters, 81, 1881 (1998). Abstract. Laurent Sanchez-Palencia, Maciej Lewenstein, "Disordered quantum gases under control". Nature Physics, 6, 87 (2010). Abstract. Ernst Helmut Brandt, "Vortex-vortex interaction in thin superconducting films". Physical Review B, 79, 134529 (2009). Abstract. J. Wehr, A. Niederberger, L. Sanchez-Palencia, M. Lewenstein, "Disorder versus the Mermin–Wagner–Hohenberg effect: From classical spin systems to ultracold atomic gases". Physical Review B, 74, 224448 (2006). Abstract.